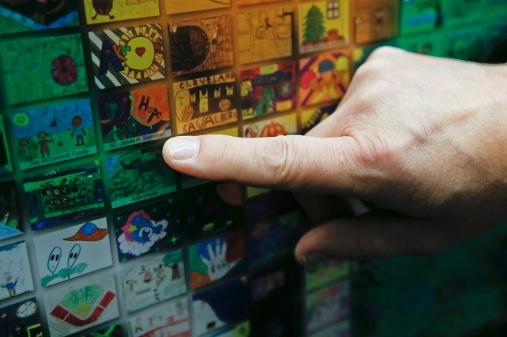 The “Celebrating Children’s” mural was unveiled on the hospital’s 125th birthday. As part of the Building on the Promise campaign, donors had their name included on a tile. To bring the project to life, the hospital relied on the talents of many – Project S.N.A.P. 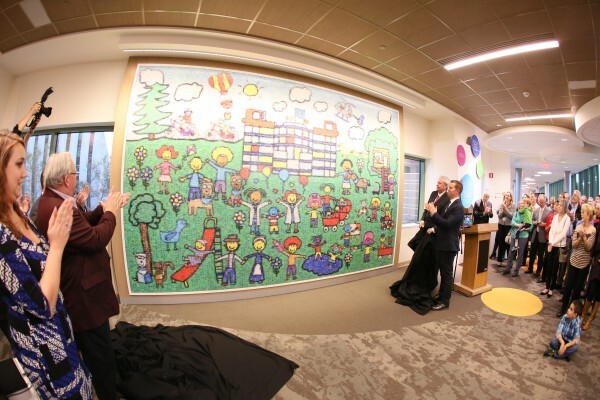 to bring community and art together to support a common cause – the hospital; an internal design committee to establish the theme of the mosaic; and best-selling author and illustrator, Todd Parr, who, along with Project S.N.A.P., created the mural.The mosaic’s theme of “Celebrating Childhood” is depicted in a colorful 15 by 10 foot mural that took 2 years to produce and 10,000 pieces of artwork – hand-drawn and colored – by individuals and organizations throughout the community. Donor Laurie Waligorski points to the tile with her grandson’s name on it. The Celebrating Children’s mural was made possible through generous support from the John S. and James L. Knight Foundation, Kay® Jewelers and Akrochem. Additionally, more than 400 donors who supported the Building on the Promise capital campaign are recognized on the artwork. To get a closer look at the mosaic or to search for individual artwork and its exact location in the mural, visit the Project S.N.A.P. online art museum at projectsnap.org/akronchildrens.